We are having some fun with the If You Give A..... series. It all started with If You Take a Mouse to School during our Back to School week but once you read one book from this series - you can't just stop! So I decided we would do an author study and have some fun with the books in this series. There is so much fun to be had with these books! & it was a big hit with the Lil Divas. 2. Cut chocolate chip shapes from dark brown construction paper and label w/lower case letters of the alphabet. 1. Child is given the large cookie cutout on a metal baking sheet. 2. child will turn over the mixed up cookies labeled #1-10 and will add the correct number of chocolate chips (magnets) to correspond to the number on the small cookie shape. 1. 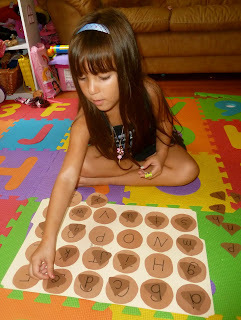 Child is given the cookie cutouts and will count the chocolate chips to add and will write the answer on the line provided. 3. Erase and repeat for a new problem. Have you had any fun with this book? I'd love for you to share - leave me a comment/link! These last two posts are fabulous. We really like the "if you give.." book series. I am visiting from Creatively Content. I will look forward to coming over for Sunday (sounds like I am coming for tea :))for your child centered link up. Thanks for the invite and again these last two posts are great. I might just have to use some of these ideas. I love those stories. My oldest loved If you give a mouse a cookie when he was little. We then bought the book that had all the stories in it. And yum...those cookies look delicious!!! my daughter loves this book. 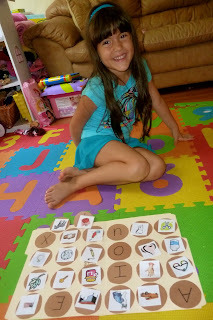 thanks for the great ideas to make this book even more fun + educational! Very fun unit! My 6 year old just pulled that book back out, this morning - great book! Now I want pancakes! What a wonderful unit! I l love the "If you give a......" series, and your ideas are simply adorable!! Cookie math is a fabulous idea. I'm all for the subtraction part! 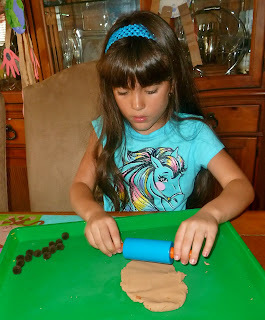 Love the playdough cookies and the magnet math. This is a favorite book at our house and one the kids want over and over so I'm always looking for new ways to extend the book! Thanks. What a fun-filled week!! I LOVE all your activities! We just did some math using this book last week too. I have to say, learning in your house really is always fun :-) go you! I really like the idea of matching lower and upper case letters together. It can be confusing for children. I need this for my granddaughter.